"I'm Luke Skywalker, I'm here to rescue you!" That doesn't exactly sound like something a farm kid who'd never been off his homeworld would say, especially while sneaking into a terrifying Imperial battle station, but that's just the kind of guy Luke is! Now your little Star Wars fan can dress up as his favorite galactic hero for Halloween in this awesome Deluxe Child Luke Skywalker Costume! The eager young moisture farmer may have grown up on a sleepy desert planet, but he's been dreaming about adventure his entire life! That's probably how he was able to get the hang of hyperspace jumps and blaster fights so quickly once he and Obi-Wan Kenobi took off on their fateful mission. It also helps that the Force runs strong in his family, which definitely came in handy when he was sneaking into the Death Star to rescue Princess Leia, and then later when he made an impossible shot that blasted it into space dust! And his aunt and uncle always told him bullseying those womprats in his T-16 was just a waste of time! There's no telling what kinds of intergalactic journeys your kid will go on, but this licensed costume will make sure he's ready for whatever he runs into. The outfit is designed to look just like Luke's rugged desert tunic from A New Hope, and includes a molded plastic utility belt and boot tops attached to the pants. 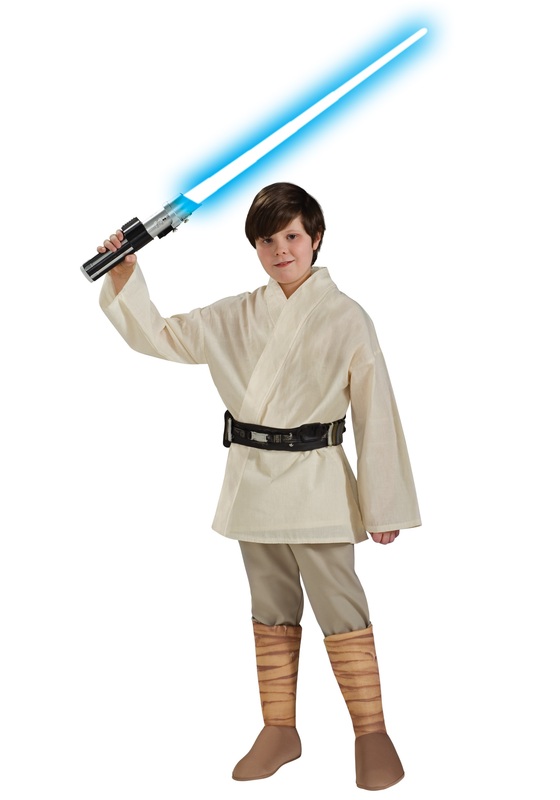 Be sure to get him a toy blaster to take on his adventures, or even a lightsaber so he can get a head start on Jedi training!